Last weekend ARDB team member Lou Luddington kayaked over to Skomer Island, Pembrokeshire and had a blissful afternoon enjoying the island wildlife. Wonderful sightings were had of some of the 25,000 Atlantic puffins that visit the island to breed at this time of year and the island was swathed in wildflowers. But most memorable from the day was a Short-eared Owl hunting for Skomer voles along North Valley. It was quite unconcerned by all the human visitors very close by and dropped to the ground several times in attempt to catch a meal. 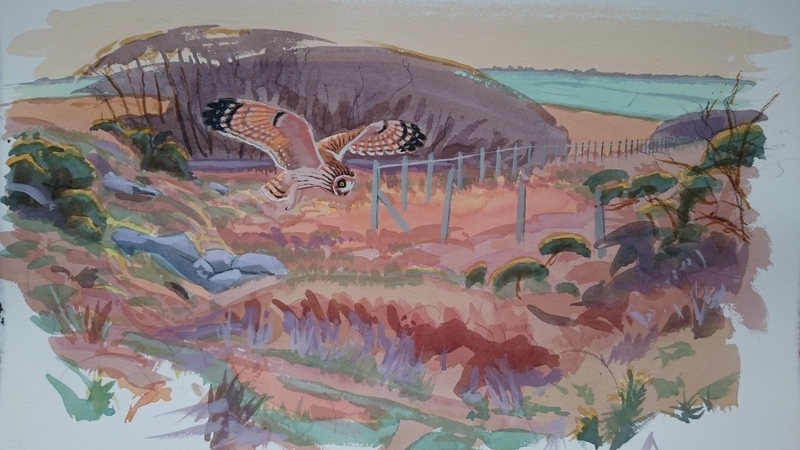 No photos were taken at the time so here is a painting of a Short-eared Owl hunting at the Dowrog Common, Pembrokeshire by our very own Rob Davies.